What do you treasure? What is precious to you? You may collect sand from every country you go to. All these tiny bottles of sand mean a lot to you; but if you give them to me, they would be meaningless and I’d just toss them out. Perhaps you are an IT hardware expert. A microchip that is an inch by an inch may be a powerful solution to a long-standing performance issue in certain computers. But if you give that chip to me, it would be just a waste of space if I keep it. In Matthew 7, towards the end of the Sermon on the Mount, Jesus preaches on how we shouldn’t judge others. On top of that, Jesus adds a line that may seem odd in the context of judging others – Do not throw your pearls to pigs. In this study, we will examine what Jesus meant by that and how it relates to his sermon on not judging others. 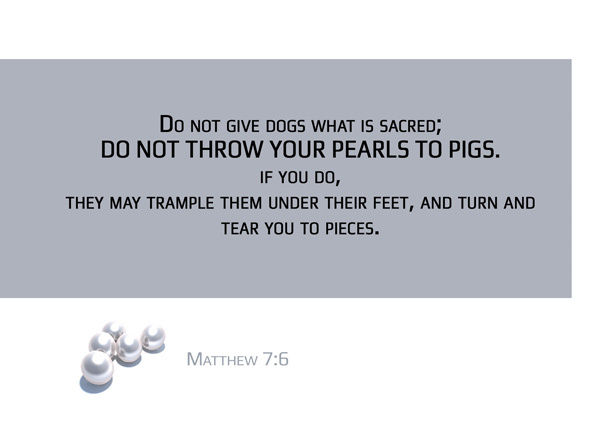 do not throw your pearls to pigs – I love the KJV rendering of this phrase – cast not ye pearls before swine. Basically, what does this mean? Pearls have no value to pigs at all. Pearls do not interest pigs at all. They prefer slop. If you put a pearl before them, they are not likely to pick it up or try to protect it – no, they will likely step on it, for what else is there for them to do with it?. This calls for discretion and discernment in the way we relate to people who do not share our biblical notions and values. Not everybody is open to the gospel, not everybody who is open to the gospel is ready to listen to some of the more complex concepts in the Bible. Some things are indeed too sacred and too precious to be shared with just anyone, anytime, anyhow. Evangelism isn’t about putting the gospel on a loudhailer and turning the loudhailer on everywhere you go. Effective evangelism is a lot about getting the ‘when’ and the ‘who’ and the ‘how’ to share the gospel right. One of the most prominent examples of people not being ready to receive the word of God is in Paul’s ministry, when he tried to reach out to the Jews in Jerusalem. Paul prayed at the temple and saw the Lord speaking to me. ‘Quick!’ he said. ‘Leave Jerusalem immediately, because the people here will not accept your testimony about me.’ [Acts 22:18]. We know what happened thereafter. Because he was rejected by the Jews, he was sent by the Lord to become the apostle of the Gentiles [Acts 22:21]. In this example, the pearl remains the gospel, but the swine were the Jews, and they had trampled on the gospel with their unbelief. Not meant to be offensive, but simply an analogy. Paul was told to leave quickly, for he had outstayed his welcome and was in danger of the swine turning around and tearing him to pieces. It’s really not just about non-Christians though. Like it or not, you’d probably have faced Christians whom you simply cannot agree with. Or Christians whom will not rejoice with you in your triumphs and instead dig at you and downplaying them. Surely you have tried bearing your feelings out to somebody – christian or not – and all you get in return is laughter and ridicule. It takes discernment too, whether you can and should share about some of the skeletons in your closets in a bible study group. It may or may not be appropriate, some of the members may or may not be ready to hear it, and some people may just plainly judge or ridicule you about it. That’s giving a dog what is holy, too. That’s giving a pig a pearl, too. Like how a Presbyterian may often argue on the finer details of theology with a Pentecostal, and how Sadducees and Pharisees never saw eye to eye especially regarding resurrection, you may not always be torn to pieces, but even as you find your own pearl being trampled, you may realise that you are trampling your brother’s pearl as well. Or perhaps you are the one tearing somebody else into pieces. your pearls – the most important question is, do you treasure your pearls? Do you treasure the word of God, or are you ashamed of it? Perhaps even before you have given it to a swine, you may have trampled on it yourself. Are you truly able to say, like Paul did, that you are not ashamed of the gospel [Rom 1:16|Article]? Do you see these pearls as yours? Or do these pearls mean nothing to you that you will not be bothered even if they get trampled by others? There is a time for everything. In your entire lifetime you may not be the appropriate person to share the gospel with your neighbour. Perhaps your neighbour hates you and without knowing it, the minute you open your mouth, he rejects everything you say. And you’ll never know why he hates you, maybe you snore too loudly when you sleep, maybe you look like the man who stole his bride at the altar. But it doesn’t mean that this neighbour of yours is lost forever – his little nephew from another continent may be the one to spread the gospel to him one day. Let’s treasure the gospel as what it is – precious like pearls and sacred. It’s not that the gospel is too good for some people, certainly not, but let’s not cheapen the gospel in our desperation to evangelize.